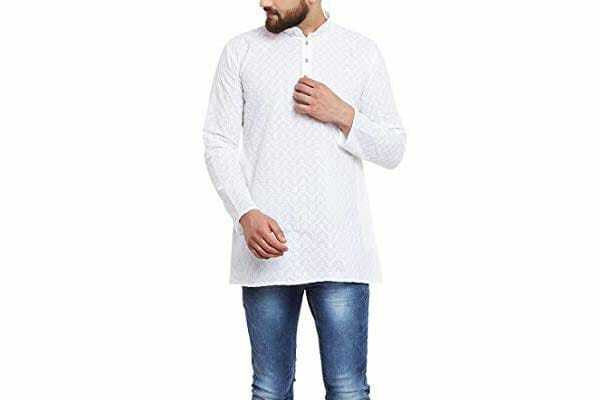 The Indus Route by Pantaloons Boy's Polyester Straight Kurta is the best men's casual kurta in India from Pantaloons. The black piece made of polyester features a round neck, a band collar, full sleeves and has a short hemline. Pair it with denims and boat shoes to complete your look. 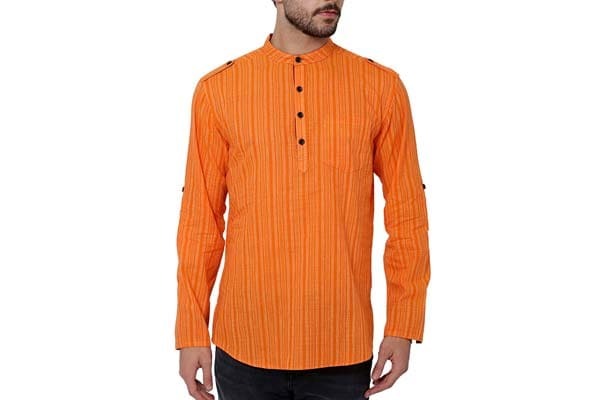 A 100% cotton casual kurta for men from Svanik, this striped piece is a nice change if you're usually donning dull colours. Features a single chest pocket, a short button placket, shoulder straps, roll-up sleeves, a mandarin/band collar, side slits and a curved hem. Pair it with denims and sandals. The Indus Route by Pantaloons Men's Kurta is the best men's casual kurta in India from Pantaloons that will add cheer to your wardrobe. 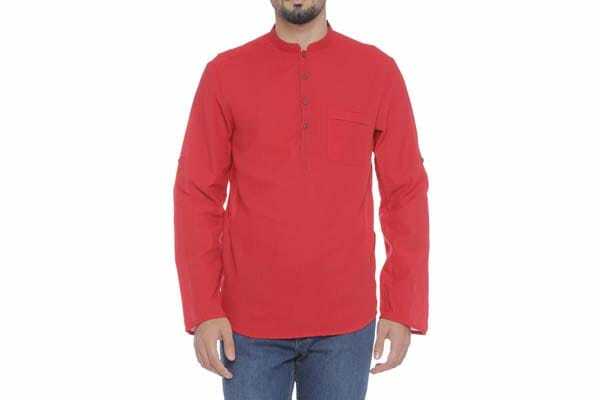 Made of 100% cotton, the slim fit red piece features a round neck, a mandarin collar, full sleeves and a short hem. Pair it with jeans/shorts, and wear it all through spring and summer! 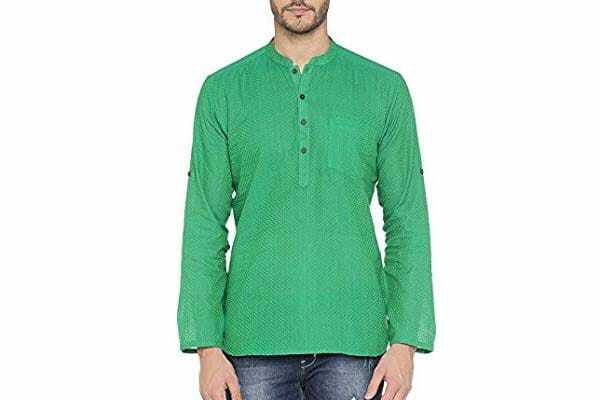 If you like earthy colours, here's a bright green casual kurta for men from Pantaloons with geometric, triangular print all over. Made of 100% cotton, it's a piece that will keep you cool through spring and summer months. Features a band collar, a front pocket, a button placket, long sleeves and a short hemline. 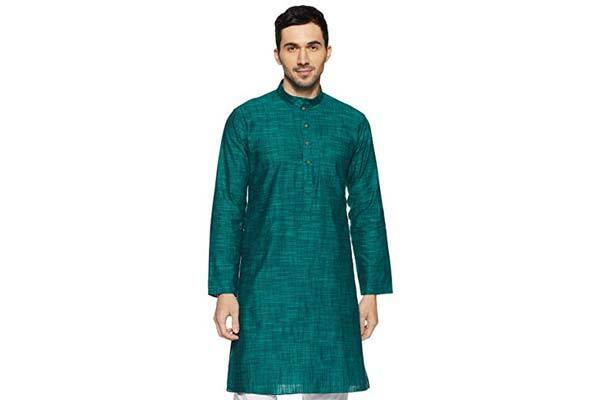 Among the best casual kurtas for men in India from Manyavar, this piece is an easy statement-maker and doubles as festive wear when paired with a churidar/pyjama. The seagreen piece features a band collar, a long button placket, long sleeves and a longer hemline than other options available. Pair it with jeans if you're going casual. If you're shopping for your summer wardrobe, get this white piece from Sojanya -- it's made of 100% cotton and is designed to reflect heat, unlike its darker counterparts which absorb it.The piece features a band collar, full sleeves, a short button placket and a long hem. Pair it with blue jeans and boat shoes. 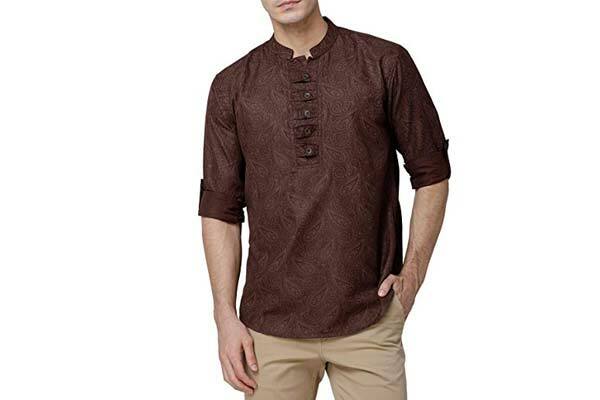 The best casual kurta for men from Svanik, this brown piece is among the more stylish options available. We love the ruffled button placket, and the tessellating print all over. The pieces features a band collar, roll-up sleeves and a short hem. For casual outings, wear this with jeans, and for more formal occasions, trousers. 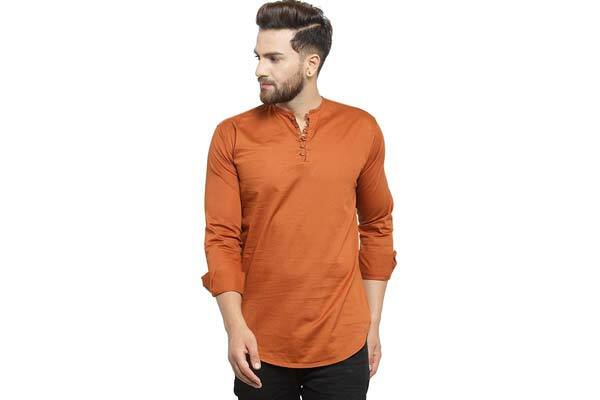 The rust sheen of this Slim Fit 100% cotton casual kurta for men from Pacman is definitely unique. Wear it for both casual and formal outings. The piece features a round neck, a curved hem, a button placket and roll-up sleeves. Pair it with blue/black denims and sandals/ethnic footwear. 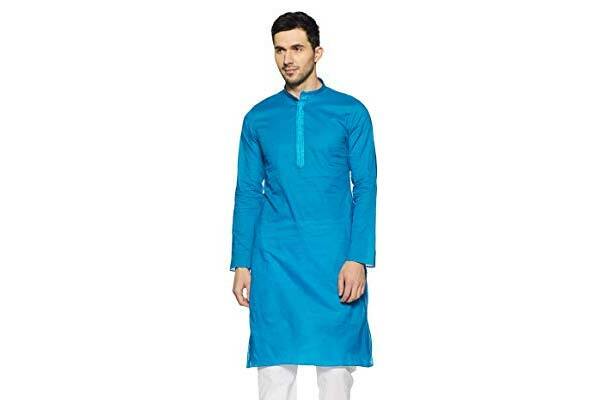 The Manyavar Men's Blended Kurta & Pyjama Set includes a bright blue kurta with a white pyjama. If you want to wear this casually, ditch the pyjama pair the kurta with jeans and sandals. The piece features a band collar and a styled placket with no buttons. It's available in 2 other colours -- light orange and turquoise. 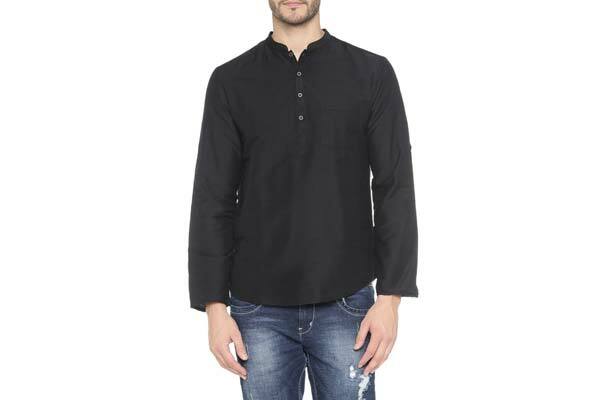 The Black Mirror Men's Art Silk Kurta is among the best men's casual kurtas in India in the casual-formal segment. This silk piece features a band collar, a button placket, a long hemline and long sleeves, making it perfect for both casual and formal outings. Pair it with jeans or a churidar, and get it in Maroon, Orange or Blue. 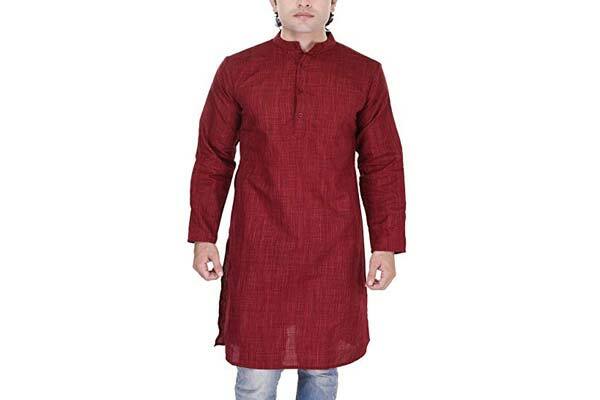 Tweet to us @HotDeals360 & submit your reviews of your favourite men's casual kurtas in India!